KANSAS CITY, Mo. (AP) — Tyreek Hill was asked what goes through his head when a play breaks down and Patrick Mahomes is forced to improvise, and the Chiefs’ wide receiver basically body-shamed his starting quarterback. Now, there are a couple of things worth mentioning here: First, Hill’s world-class speed makes just about everybody look slow, even a quarterback with better-than-average speed. And second, Hill calling his QB slow is just part of the innocent banter that goes on daily in the Kansas City locker room. These aren’t the Chiefs of yesteryear, when veterans such as Derrick Johnson, Tamba Hali and Alex Smith ruled the locker room. These bunch of Chiefs talk as much good-natured trash to each other as they do opposing teams, and the byproduct is a locker room that has grown remarkably close, and has been able to keep things light during a 4-0 start in which the spotlight has been bright. Need another example? Take Mahomes’ unique voice. He’s been chided about what coach Andy Reid called its “froggish” quality ever since Mahomes was in middle school. Mahomes long ago accepted it, and in truth he appreciates a good joke or imitation. Word in the locker room is Reid does it best, though he was unwilling to indulge during his weekly news conference. Wide receiver Demarcus Robinson also has a spot-on imitation, and tight end Travis Kelce — one of the longtime jokesters in the Chiefs locker room — is also quite good. “I’ve heard the jokes since I was like, in the seventh grade,” Mahomes said, “but it’s something I’ve embraced. Kelce and Tyreek throw some shots at me, but I throw some shots right back. All these hijinks have helped the Chiefs deal with the pressure that comes with a perfect start, one that has the NFL buzzing. Three of their wins have come on the road, including tough venues in Pittsburgh and Denver, and they appear to be the team to beat in the AFC West. 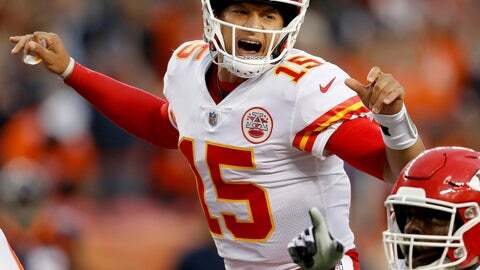 Mahomes has thrown 14 TD passes without an interception, becoming not only the toast of Kansas City but a fantasy football darling everywhere. Kelce, Hill and newcomer Sammy Watkins have helped him flourish in an offense that seems predicated on fun, first and foremost, and running back Kareem Hunt is coming off his first 100-yard game, lest anybody think they can’t go old-school. The result has been a crush of attention unlike anything the Chiefs have seen in recent years. Mahomes gets several hundred interview requests each week, and Kelce and Hill are bombarded when they go out in public. So many reporters and TV crews crammed in the club’s tiny media room Wednesday that one openly pondered whether it was a violation of the fire code. You wouldn’t know it from the way the Chiefs go about their business, though. Mahomes has a habit of locking himself in the film room, and nobody is trying to escape early when Friday rolls around. Keeping things light helps to accomplish just that. The latest subject of discussion had to do with whether Mahomes, a former prep basketball star, has enough ups to dunk. He insists there is video evidence showing him dunking during a high school game, and a grainy video surfaced on the internet that purportedly shows him poster-izing a defender. Let the trash-talk roll on.